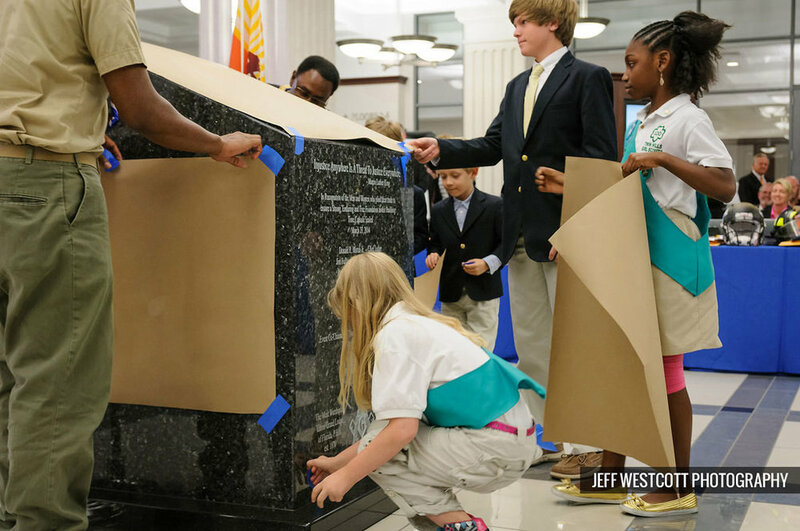 The mayor, two former mayors, three sheriffs, the state attorney, and the chief justice of the Florida Supreme Court were among the dignitaries on hand for the unveiling and sealing ceremony at the Duval County Courthouse. Many of them shared thoughts about the the history and significance of the courthouse, the building project itself, and items they were placing into the time capsule. Story and photos were featured in the March 28 edition of the Financial News and Daily Record (link here). In keeping with tradition, the Freemasons played a large part in the ceremony. Below, members of the Most Worshipful Grand Union Lodge prepare to enter the courthouse. Below: former mayors John Delaney and John Peyton share a light moment. Below: Jacksonville Fire & Rescue color guard. Below: Clerk of Court Ronnie Fussell makes remarks while other officials wait to describe their contributions to the time capsule. Below: Jacksonville Jaguars President Mark Lamping holds a team helmet to be placed in the time capsule. Below: Daily Record Publisher Jim Bailey (right) pauses to take a "selfie" with Judge Moran and Chief Justice Ricky Polston, Fla. Supreme Court. Below: local children unveil the time capsule.